In february we are applying another pre-emergent weed barrier for crabgrass prevention this year. It has been a very cold winter for your lawn. We have had several freezes and nearly all lawns are dormant. A dormant lawn is not strong enough to prevent weeds naturally and we are applying another pre-emergent weed barrier as a result. This application must be applied before soil temperatures reach 72 degrees and crabgrass begins to germinate. Next month we are able to resume fertilization and will begin to restore color to your turf. 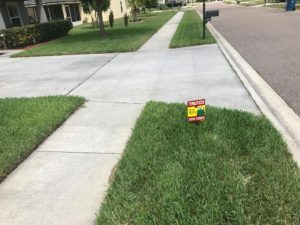 In addition to the pre-emergent weed barrier, we will continue to treat active large patch and active insects during each monthly lawn care service. Fungicides must be reapplied every 28 days. Insects are active year round but the threat of damage is greatly reduced in the winter. Dormant, slow growing turf is not a very good food source. Reducing irrigation is the best prevention for large patch. You can expect your lawn to lose color this time of year. This is a natural part of your lawn’s life cycle.